Climate change is linked to emissions, in turn to economic growth. Limiting emissions is then about limiting growth. Thus, sharing growth between nations has been the main bugbear. The UN Framework Convention on Climate Change expressed the principle of equity by enjoining countries to take action based on common but differentiated responsibilities and respective capabilities. The fourth assessment report of the Intergovernmental Panel on Climate Change says that to avoid serious ecological and economic damage, the global temperature should not exceed 2C from the pre-industrial level--it has already increased 0.74C.This in turn needs CO2 concentration not to exceed 350-400 parts per million (ppm). But this touched 379 ppm in 2005. If the world is to remain within the 2C target, there is limited scope for future emissions. The global budget is extremely tight. The question is how to share it. Over the years, different proposals have been presented. These have been based either on current and future emissions or historical emission burdens of different nations. The sinks approach requires that the world not emit more than what the sinks can absorb. In 1991, the Delhi-based Centre for Science and Environment (cse) proposed the concept of equal per capita entitlement based on available sinks on land and in oceans. Those on land are national property, but the oceans, which absorb around two billion tonnes of carbon (tC) each year, are global commons to which all people have an equal entitlement. Once entitlements are defined, low-level polluters would have an incentive to keep their emissions growth path low trade unused emissions rights to high-level polluters. The budget approach requires an upper limit of CO2 concentration in the atmosphere, and sets down the year by which this limit must be reached. This gives a budget of total emissions to be distributed equitably among nations on per capita basis. A country not using its quota in a given year can trade it. The convergence approach agrees on a per capita emission level to meet the 2C target. This would provide each person about two tonnes of CO2 (tCO2) per year. Countries above this limit would have to cut emissions, while those below it would have the opportunity to increase emissions. While it industrialized over the past 150 years, the developed world emitted much more greenhouse gases (ghgs) than developing countries. This historical inequity can be accounted for in a number of ways to create equal entitlements. In 1989, the International Project for Sustainable Energy Paths proposed that if the climate system was to remain stable, the world could emit no more than 428 billion tC between 1950 and 2100. Nations would share this budget on a per capita basis over the same period. If developing countries continued to emit CO2 at their 1986 rate, the project said, their quota would not get over till 2241. Developed nations had already used their quota by 1986. A few months before the 1997 Kyoto agreement, Brazil proposed that emissions targets be determined on the basis of contribution to temperature increase up to 1990. This put the focus on industrialized countries; while they were responsible for 75 per cent of the total emissions, their share for temperature increase was 88 per cent. The proposal required that countries falling short of their targets be fined us $3.33 for each extra emission unit. The money thus accrued would go into a fund to finance mitigation and adaptation projects in developing countries. In 1990, Kirk Smith formerly of the University of California's School of Public Health introduced the concept of natural debt, which accounted for cumulative emissions of each country from 1950. Just as there are economic disruptions when the financial debt grows too large, there will be ecological disruptions if the natural debt is too large, Smith argued. He showed the industrialized countries to be the largest natural debtors. He also showed that the international press's current villains, India and China, will take decades to match the us in terms of natural debt. For instance, by 2025, India's natural debt will be five times less than that of the US. The model, proposed earlier this year by the Ireland-based Foundation for the Economics of Sustainability, requires that the world first agree to a maximum emissions level from burning fossil fuels. Once the emissions cap is fixed, emission levels for a year would be shared equally among the global adult population. Each individual would receive a pollution authorization permit which could be sold at market rates. Fossil fuel companies could buy permits from financial institutions to cover emissions from their products. The amount of permissible emissions would be lowered each year so that it was under levels that could destabilize the climate. A yearly reduction of emission allowances would increase the market value of permits, raising incomes of the poor--who emit less--and enabling them to buy expensive food and fuel. Its proponents say that the cap-and-share model offers an orderly market-based path to manage the transition from fossil fuels to alternative energy. The drawback of this approach is that it does not account for historical emissions. The Greenhouse Development Rights (gdr) framework, proposed by Paul Baer and Tom Athanasiou of EcoEquity and Sivan Kartha of the Stockholm Environment Institute tries to answer the oft-repeated criticism about inequity in emission within the developing world. It incorporates the rich, even in the developing world, to share the burden of reducing emission by 80 per cent from 1990 levels by 2050. To fix responsibility for the climate problem and also ascertain the capacities of nations to pay for a solution, gdr divides countries into two groups based on income. People below a certain income level--the development threshold--are absolved of responsibility, and not required to bear costs. gdr sets us $9,000 per year (in terms of purchasing power parity, ppp) as the development threshold. Those above this threshold are assumed to have realized their right to development and expected to pay for climate mitigation. To determine how many people have to pay and how much, gdr introduces two concepts responsibility and capacity index. The capacity 'C' of a country is the sum of all individual incomes above the development threshold. For example, let's assume that in a country 10 per cent people have yearly incomes above us $9,000. In that case, the individual incomes of this group above the threshold are added up to arrive at the country's capacity index. Responsibility index 'R' is calculated as the total of a country's cumulative per capita CO2 emissions from fossil fuel consumption since 1990, above the developmental threshold. gdr deems emissions related to the share of income below the development threshold-equivalent to the part of national income that is not considered in calculating a country's capacity-as survival emissions. Emissions linked to income above the development threshold are luxury emissions and they have to be accounted as country's responsibility. gdr then combines these two concepts to calculate a Responsibility and Capacity Indicator (rci), which assigns each country its share of the mitigation and adaptation costs. According to the method, the us must shoulder a little more than a third of the global costs and the eu roughly, a quarter. China's share is less than one-fifteenth while India's is less than one three-hundredth. Under gdr, all Americans earning more than us $9,000 will on an average pay us $780 annually to mitigate and adapt to climate change. The burden on Indians in the same bracket will be us $51 and for China us $142 (see table GDR burden sharing proposal,). 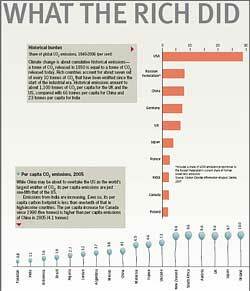 There is nothing wrong in asking the rich in the developing world to pay for emissions reductions; in fact national governments should tax the rich and use the money to invest in clean energy and technology. But this should be part of national agendas and not international burden sharing arrangement. There is also a problem when 'survival emissions' entitlement of a rich country is far higher than that of a poor country and survival emission entitlement of a polluting country is far higher than a clean one. For example, consider India and the us. India's per capita income in 2005 was us $3,452 (ppp adjusted) while its cumulative per capita CO2 emissions between 1900 and 2005 was 3.5 tC. So the survival emissions at the threshold of us $9,000 (ppp) is calculated to be 9.1 tC for India. The us, with per capita income of us $41,565, and per capita CO2 emissions of 80.4 tC, is entitled a survival emission of 17.4 tC. So, for the same development threshold, an American gets a higher emission entitlement (17.4 tC) than an Indian (9.1 tC). Any emission above 9.1 tC in India will be taxed, whereas this level is 17.4 tC for the us. Countries that have a large majority below the development threshold stand to lose their emission entitlement compared to richer nations. For example, in India more than 95 per cent of the population falls below the development threshold of us $9,000. This implies the emission entitlement of most Indians is equal only to their current emissions level. In contrast, 90 per cent of Americans are above the development threshold, and get an emission entitlement corresponding to the threshold emission level. In this sense, the gdr framework deprives most Indians of their basic development entitlement. The other problem with gdr is that it seems to reward historical and heavy polluters. By taking historical emissions from 1990-and not 1950 or even beyond, for which we now have robust data- gdr dilutes the 'polluters pay' principle. To say that emissions before 1990 "were usually (though not always) made in ignorance", misses the moral point that people have benefited from the actions of their ancestors in overdrawing environmental assimilative capacity. The current standard of living in the developed world would not be as high today if previous generations had directed more resources to ghg reductions. 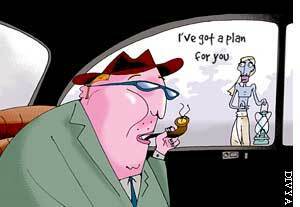 If the present generation has acquired assets from previous ones, it must also accept their liabilities. It is important to recognize that the climate change is primarily due to ghgs which were emitted when the developed world industrialized over the last two centuries. A 'burden-sharing' framework must recognize this fact. The proposal also needs review because it rejects per capita entitlements for future emissions. Under gdr, the per capita entitlement-so-called developmental rights-of developed countries between 2011-2025 period is far higher than that of the developing countries. For instance, the per capita CO2 emissions allowed to the us between 2011-2025 is about 12 tonnes per annum; for the uk it is about 9 tonnes per annum, while India is allowed a mere 1.65 tonnes per annum. A recent Heinrich Boll Foundation sponsored study by Ecofys Germany exposed a few shortcomings of gdr and other burden-sharing approaches. It found that developing countries like India and Pakistan, which have low responsibility capacity index will not require to cut down much on emissions in the short term. However, these countries will be committed to far stringent commitments in the long term. Despite these drawbacks, gdr shows that massive emission reductions are required from the developed world. It also shows how developed countries have over-consumed the global common environmental sink. Under the framework, wealthier countries have to reduce emissions by more than 90 per cent over 1990 levels by 2050. 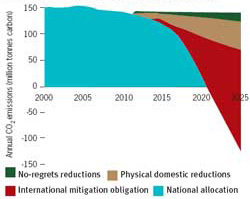 Indeed, for wealthy countries like the us, the uk and Germany, reduction obligations exceed even total baseline emissions (see graph Hypothetical emissions reduction target under GDR). So even if these countries were to reduce their emissions to zero, they would still be bound to pay for emissions reductions elsewhere.